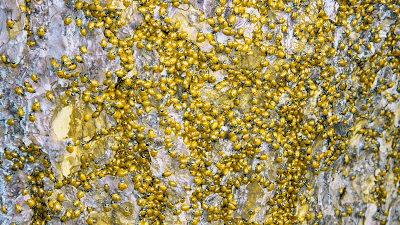 Mostly subterranean, these beetle swarms, or colonies, may be mistaken for a vein of gold running through the stone from a distance. Also known as merry maidens, and miner's delight, they are considered a good omen by most miners. On approach an observer will smell a hint of overripe apricots. When directly surrounded by the beetles the fumes of alcohol they exude will be almost overpowering. Anyone spending time in the vicinity of Brandyvein Beetles will become intoxicated. While size and constitution play a role in the extent of the effect, a turn breathing these fumes is enough to make the doughtiest stalwart stumbling, word-slurringly drunk. Whether this is dangerous or not depends on what other creatures lurk in the vicinity. Charming! Excellent idea to have something capable of being mistaken for something else from a distance. I like this and the Widow's Hair too. Thanks. Let me know if these things inebriate any of your characters.